These beautiful, contemporary taps are made from solid brass with a high quality polished chrome finish to ensure sleek, minimalist lines which perfectly compliment any modern bathroom.quarter-turn disc valves for ease of operation and is ideal for people with restricted movement in their hands. The ceramic disc technology extends the life. 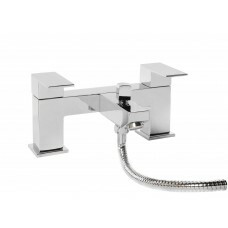 Manufactured for GEM Taps and Showers. The brand the trade trust and use.